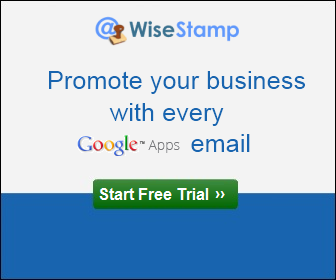 WiseStamp Email Apps (PRO Plan Yearly Subscription) - The Google plus Email App allows you to share your latest public G+ status in your emails. Let people Circle and follow you directly from your email. Every email you send will show your freshest public G+ update. Grab it now! WiseStamp Email Apps (Plus Plan Yearly Subscription) - The Google plus Email App allows you to share your latest public G+ status in your emails. Let people Circle and follow you directly from your email. Every email you send will show your freshest public G+ update. Grab it now! WiseStamp Email Signatures: Empower Your Emails with Free Email Apps - Share Facebook, Twitter, Linkedin, eBay...Add Green Footers, Email Disclaimer, Funny Quotes... WiseStamp Email Apps enable users to easily transform their day to day emails into a powerful social and effective marketing tool. 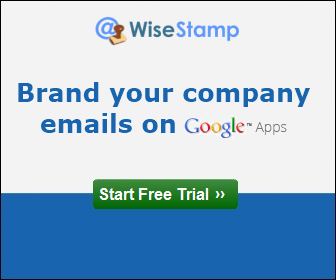 With WiseStamp Email Apps users can easily add their most relevant personal & brand information to their email signature. Easily promote their Facebook page, Twitter profile, blog posts, company news or latest eBay product...Create a professional looking email signatures, Use multiple signatures from within their Gmail, Yahoo mail, Hotmail...etc.